Game Trail Cameras has many uses; for scouting, wildlife hunting, and home security surveillance. Every device has different features that matched every user’s taste. Below is the list of the best game trail camera for wildlife. These cameras are best recommended to use in wildlife hunting as it offers features that suits outdoor activities. The list of the best game trail camera for wildlife can be sorted by infrared type, wireless capability, and fast trigger speed. These are the things that you might consider in searching for the best game trail camera for wildlife. Armed with 12-megapixel image resolution, Tec.Bean provides you a stunning quality of images. Its 1920x1080P video resolution could give you high-definition videos for filming. This trail camera is issued with vivid imagery to every detail of the wildlife. It can produce up to nine photos per trigger with the trigger speed of 0.6-0.8 seconds. Any movement detected by the camera will not be missed and will be captured instantly. The nighttime vision range can extend up to 75 feet with 36 pieces no-glow IR LEDs. There are two modes that this camera offers to give you more options in filming; hybrid mode, and motion detection mode. This camera guarantees you a double protection as it is supported by IP66 feature for a waterproof casing and password protection from camera thieves. Tec.Bean Game Trail Camera is no longer limited to warm-blooded animals. With the two modes offered by the camera, it could give you multiple applications in using this. Seen in the image stamp are time, date, temperature, moon phase, pressure, and geotag. It has an additional feature for an adequate documentation in wildlife; the real-time replay, and interval recording. The battery lifespan of this camera could last up to eight months. This device is best recommended for professional monitoring and researching. It has a patented energy-saving device to lower the power consumption. The ample storage offers 32GB SD memory card that could take thousands of pictures. The images are automatically saved in JPEG format and AVI for videos. It has 2 inches color viewer TFT LCD to view the photos on the spot. It offers seven languages option. It has an energy-saving device for low power consumption. Supported by IP66 for waterproof feature. With a long night vision range. The manual does not give the details of the functions and hard to understand. The video resolution does not look like HD. Distianert Game Trail Camera would not miss any happening within the detection range with an impressive 0.6 trigger speed. It would give you no delay between the triggers when it captures images. It produces three pictures per trigger and never misses any breathtaking moment with the multi-shot feature. It provides you bright and colorful pictures by day and black and white during nighttime. 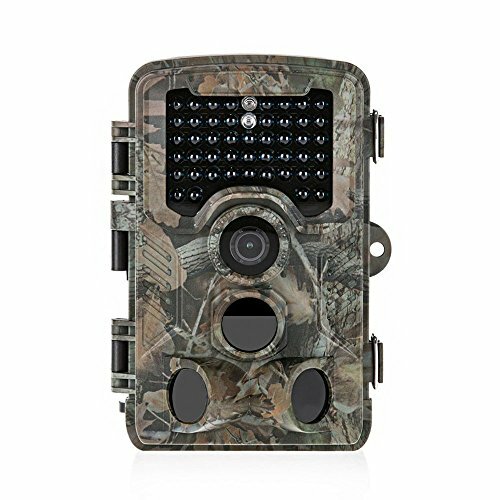 This trail camera goes with 12-megapixel image resolution and 1080P HD for video. This camera has a built-in screen display that allows you to play recorded videos directly without any connection from the computer or mobile phone. It ensures you a perfect shot in the hunting area with its 125 degrees detection sensor and 80 feet detection range. The low-glow black covert LED light gives you 65 feet flash range in the dark. 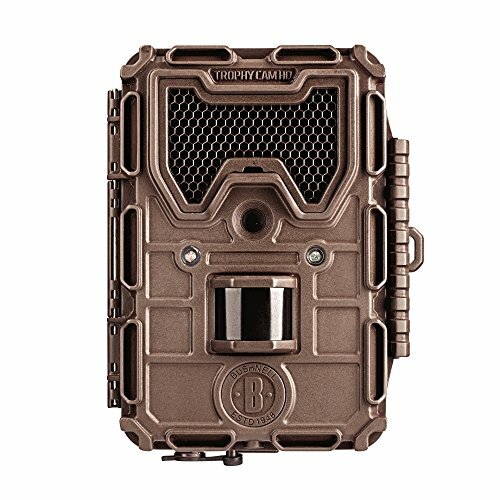 This game trail camera is supported by IP56 with a rugged and waterproof feature. You can leave it outdoors for an extended period of filming. This device is durable with a sturdy and easy-operated latch. It has 2.4 inches color LCD screen for viewing the images and videos on the spot. It provides a quick pre-setup of modes and function suitable to your needs with its quick start system function. The multi-functional controls include; time-lapse, interval trigger, multi-shot, recording timing, password protection, timestamp, and serial. It could produce thousands of pictures with 32GB SD memory card as an ample storage, and you can transfer it easily to any media enabled devices. 8AA batteries power Distianert Game Trail Camera and its lifespan last for months. This device is supported by IP56 for waterproof feature. Offers a wide detection range. It has a user-friendly set-up. Consist of quick start system function. It does not offer password for security. Crenova game trail camera can maintain every remarkable moment in the wildlife. It gives you a high-performance with 12-megapixel image resolution and 1080P for video with an excellent audio recording quality. 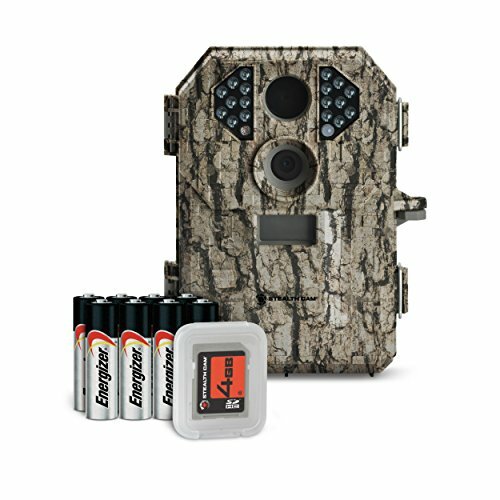 This trail camera produces colored photos in the daytime and black and white in the nighttime that captures three pictures per trigger. The 120 degrees wide angle lens provide you a proper hunting scope and allows the camera to cover a large hunting area. It has a fast trigger speed of central PIR sensor of 0.6 seconds; it can narrow down to 0.2 seconds through the PIR function. Each movement is captured and recorded in real time. It offers a built-in LCD screen which enables you to preview real-time display. This wildlife camera consists of 46 pieces LEDs that serves as the IR light up to 65 feet range. It has a significant motion detection with the detection angle of 40 degrees that brings high sensitivity. 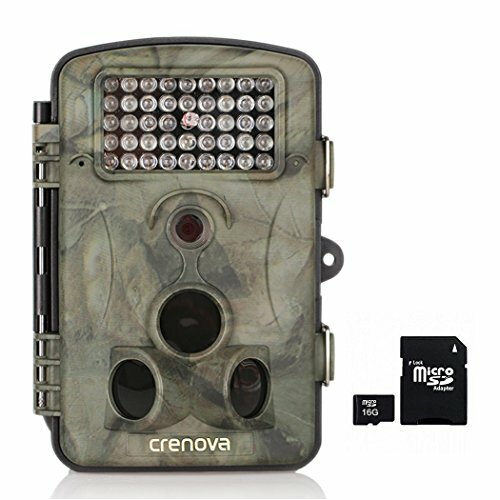 As a hunting camera, Crenova will not produce any a bright flash that may scare the animals. This trail camera is supported by IP56 waterproof design that makes it suitable for outdoor activities. It offers multi-recording modes such as time-lapse, timer, password protection, interval recording, timestamp, and low battery alarm. This device allows you to take pictures while recording at the same time by combining those option modes. Included in image stamp are temperature, time, date, and moon phase. The Crenova game trail camera is not just for wildlife but is also useful as a home security camera. Offers a wide angle lens. It has versatile applications and waterproof design. The LEDs are dimmed for the animals not to be scared. It has an advanced rime-lapse and time switch. It offers a fast trigger speed. When you are searching for a durable game trail camera for wildlife, Stealth Cam is highly recommended. It has a digital 3-D camouflage housing with an exterior design. Stealth Camera provides 6 megapixels image resolution with the video recording of 15 seconds. The 12 IR emitters give high-quality images during the day and nighttime with a detection range of 50 feet to capture all wildlife activities. This game camera has an EZ dial programming with a quick set. Stealth cam is equipped with energy-efficient design, burst rapid fire mode, and fast set for a fast an easy setup. It offers an external LCD screen to view photos on the spot and test mode. The low battery indicator feature allows you to be aware of the battery is running low so that you can change it immediately. The burst mode gives you 1-6 images per trigger with 1-59 minutes recovery time out. Time, date, and moon phase includes to the image stamp printed. This device is armed with a mini USB output for a smooth downloading capabilities. This game trail camera is easy to use, and the batteries seare still fully charged after a month. It operates on 8AA batteries or external 12V power jack. It provides a slot for a 16GB SD memory card that can hold over 450 pictures. The style of this device is neutral for both wildlife and home security. In case you want it to secure it to a fixed location, it is compatible with python cables. It is easy to grasp with an easy to customize controls. 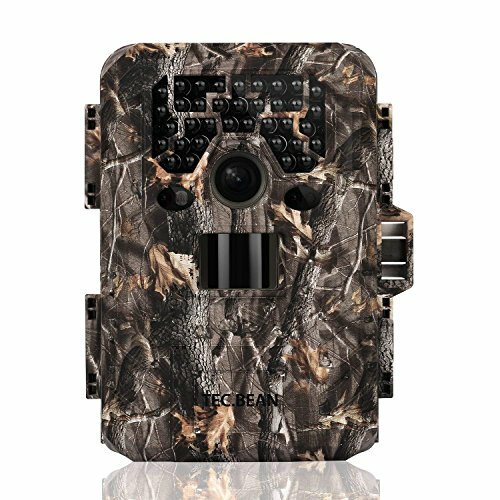 Stealth Cam game trail camera is best in wildlife, and it is also recommended for the home security system. It is durable and well-built budget camera. Has a good battery life and is reliable. It provides the EZ dial programming. It is using a camo housing. Night pictures can be blurry. 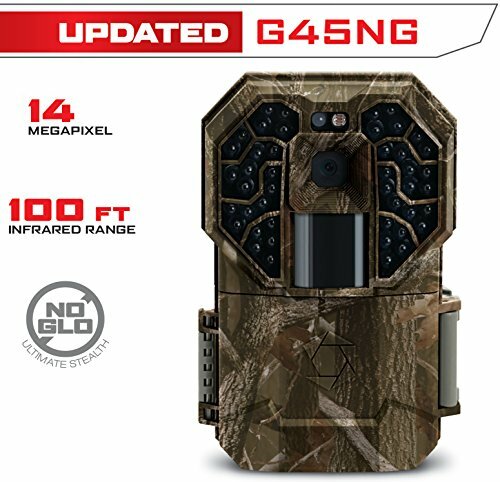 The 14-megapixel Stealth Cam Trail Camera will give you an efficient quality of images and videos. You can choose four options of image resolutions; 14MP, 8MP, 6MP, and 2MP offering a sound for video. It provides a triad 3 in 1 technology with high-resolution still images and the video records 10-180 seconds with audio. It has an advanced blur reduction for night images. In maximizing the triggers accuracy, it covers multiple zones of angles and distance. Stealth Cam is armed with geotagging to track and locate all the favorite footage with optimal GPS tagging. 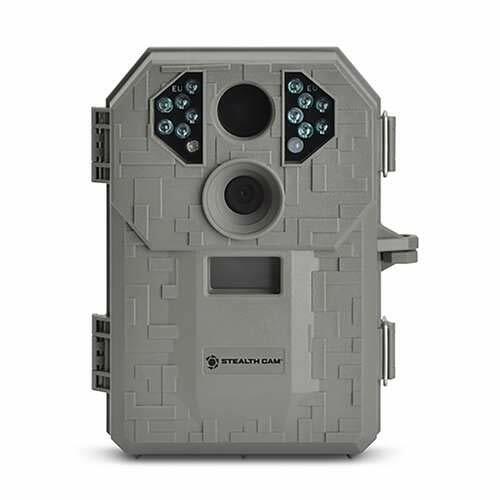 This game trail camera is useful for both wildlife and home security surveillance. The 45 no-glow infrared emitters produce excellent images during daytime and nighttime with 100 feet flash range. The camera’s detection range is 70 feet which can film a wide range of area. Stealth Cam No-Glow Camera comes with a fast triggering speed of 0.5 seconds that gives you even the smallest footage in the field. This game trail camera comes with the memory card programming. If the allocated 32GB storage is full, you can set the device to keep or delete the images to record new data. It offers the safely locking of your device with a protected password. You can choose four options for the language you prefer; English, French, German, or Spanish. The camera is best recommended if you want to capture fast-moving subjects in the detection range. It has a sensor and advanced infrared detection. The lifespan of this camera lasts up to six months in the field with a set of lithium batteries. The case design and programming is top notch. It has a video and USB connectivity. The advanced blur reduction only works best during the daytime. It is not supported with waterproof feature. Equipped with 7-megapixel image resolution, Stealth Cam P18CMO produces colored daytime images and sharp black and white at nighttime. This camera has a video recording of 15 seconds. It offers EZ dial programming with three preset modes and manual setup mode. The EZ dial programming feature prevents you from frustration in setting up the gear into the field. It could give you 1 to 6 images per trigger with 1-59 seconds of recovery timeout because of the burst rapid fire mode. The 18 night time infrared emitters can lighten an area with 50 feet of range. The flash range works up to 60 feet within the detection area. This trail game camera is more comfortable to set up with its quickset feature. Shown in the image stamp are the date, time, and moon phase. The digital 3D camouflage housing could hide this device from the attention of the animals in the area. It has a test mode and low battery indicator that warns you when the battery life is running low. This device is operated by 8AA batteries with an additional option of 12V power port. It offers a 32GB SD memory card slot for the storage that can capture up to thousands of images. For a quick downloading of files, this trail camera is armed with mini USB output. Stealth Cam P18 has an energy efficient design and time saving set up for your convenience. This camera gives durability and reliability to every hunter. It offers burst rapid fire mode. Provides EZ dial programming with quickset. Gives an option for power consumption. It does not support the weatherproof feature. The Bushnell Trophy Camera can give you realistic viewing experience with 8-megapixel image resolution and 720P HD video and audio recording. It is detected by a highly sensitive passive infrared motion sensor and is triggered by movement. The PIR sensor mode gives you the consistency of the images capture. It monitors the temperature within the detection range and regulates the trigger signal sensitivity. The motion sensor could detect up to 60 feet with a 0.6 seconds trigger speed. With 32 LEDs that work as a flash, it allows the camera to capture images in total darkness within the detection area. It gives you the explicit after-dark photos. This camera is best for wildlife hunting as it offers the weatherproof feature that can withstand constant weather conditions. This game camera is suitable for several applications; wildlife monitoring, home surveillance, and scouting game. Equipped with day and night auto-sensor, Bushnell Trophy Cam can be operated during day or night. It offers a field scan time-lapse mode that takes images at pre-set intervals. It also allows you to use two windows of image capture which is useful at dusk and dawn. One of the best things about this device is it can make pictures or video clips without the standard movement trigger. The images produced are automatically stamped with geotagging, time, date, moon phase, and temperature. It provides a geotag tag that allows you to input the longitude and latitude of the camera’s position. A 32GB SD memory card is recognized in the storage wherein you can store thousands of photos. This device is operated by 8AA batteries. The images are saved in JPEG file while videos are in AVI. Supported with a weatherproof feature. Can take pictures and videos without the normal movement trigger. It has a PIR motion sensor. Provides a fast trigger speed. Supported by an IP54 feature, Bestok Game Trail Camera is durable in any weather condition. With this, it is suitable for outdoor monitoring. The video resolution is 720P high-definition. It offers an option of four image resolutions; 3MP, 5MP, 8MP, and 12MP that produces high-quality photos and videos. This device can supply images with brightness and clarity during day and night capture. Its 24 pieces 940nm LEDs gives you a good quality of no glow pictures during the day and nighttime with monochrome in night vision. It offers a trigger speed of 0.6 seconds wherein you will never miss any footage within the detection range. The trigger interval plays from 5 seconds to 60 seconds programmable and 3-30 seconds for the video length. This game camera allows you to take photos while recording video. 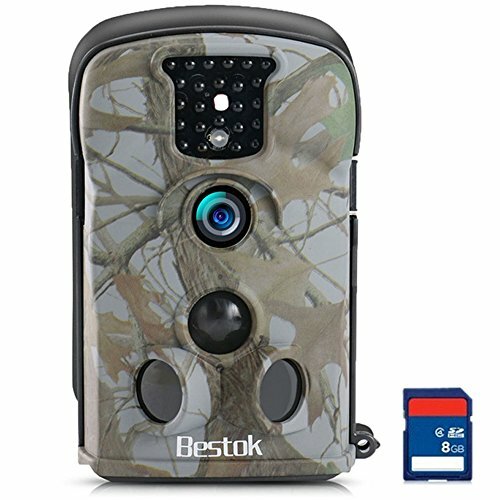 Bestok Game Trail Camera’s motion sensor can sense 65 feet in an empty area. It is more convenient to every hunter to monitor animals even far from the tree stand. The files are automatically saved in JPEG for the image and AVI for the videos. It offers an ample storage of 32GB SD memory card that can store thousands of pictures and videos. Bestok Camera is powered by 8AA batteries with a lifespan of three to six months. It has a TV and USB output to transmit images and videos instantly. The external case may not be camouflage, but it can be hidden in some specific areas. For home security surveillance, this camera could be stellar. The LCD screen measures 48x35mm that allows you to view images and videos on the spot. Supported by the IP65 feature which waterproof. It has an infrared night vision no-glow. It has a bigger field motion sensor. With 8-megapixel image resolution, Bushnell Trophy Camera HD takes hunting to a new level. It gives you colored photos at daytime and black and white during nighttime. This camera is packed with specific features that help you monitor the wildlife happenings within the detection area. These features are black no-glow LEDs and 720P HD video resolution. It features a latch system that offers durability and easy-to-use. It has a cable lock channel for the camera’s security in the area. It is supported by a waterproof feature that is suitable for outdoor activities. 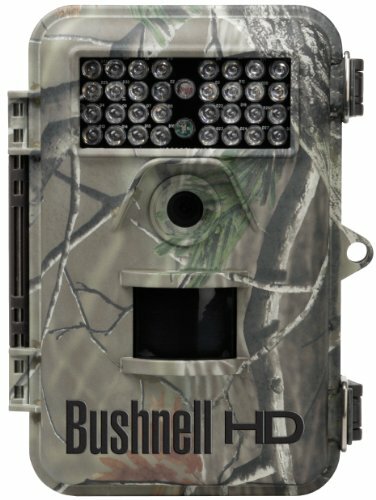 Bushnell Trophy Camera HD is also recommended for tracking game, and home surveillance. You will never miss any footage of the camera with its 0.2 seconds trigger speed. The motion sensor and hyper PIR detect heat and motion to trigger the camera and take pictures. The detection range of Bushnell is 60 feet. You have the option to adjust the PIR sensitivity to maximize the consistency in temperature conditions. It is compatible with solar energy. The LED feature includes an anti-reflection cover to minimize visibility for other hunters in the area. This device provides a day and night auto sensor. Included in the image stamp are the date, time, temperature, and moon phase. The hybrid capture mode allows you to take both image and video each time it is triggered. The multi-image mode can capture 1-3 pictures per trigger. Bushnell Cam HD provides geotagging that allows you to input longitude and latitude of its position. It is powered by 8AA batteries that last up to a year in the area. For the ample storage, it is compatible with class 4, 6, and ten speed SD cards. With a lightning-fast trigger speed. Has a strengthened cable lock channel. The quality and clarity of the image at night is sometimes inadequate. Has a weak video quality. 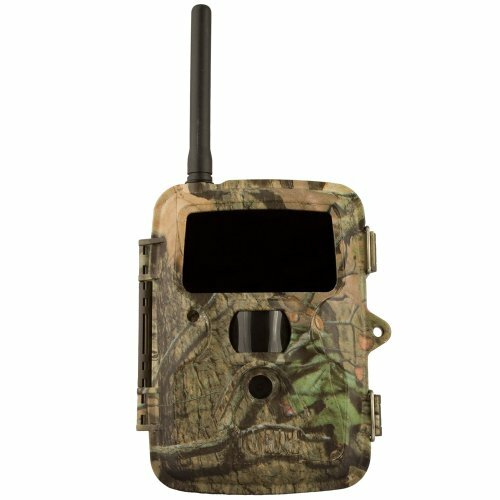 Covert Code Black Wireless Mossy Oak Trail Camera allows you to monitor and see the footage away from the area. This wireless MMS camera is activated with sim card from AT&T to text photos and transmit it directly to your mobile phones. You can access the pictures anywhere convenient to you. The undetectable LEDs with 60 invisible flash gives a high quality of photos not just for scouting but also for home surveillance. The burst may not be intense, but it works well precisely not to catch the animals’ attention. It can produce quality images during the day and nighttime capture. The three options of image resolutions; 3MP, 5MP, and 8MP, gives additional contribution for the image quality. You will not miss any happenings within the detection range of 60 feet with 1.2 seconds of trigger speed. This device is powered by 12AA batteries the can produce approximately 3000 photos and last up to months. The time-lapse mode and two-phase timer switch allow the camera to take pictures with an interval. It has a 2-inch LED screen for you to view the videos and images on the spot. It provides three adjustable sensitivity levels for you to choose what you prefer. This covert code black has a durable design and is easy-to-use. Included in the image stamp produced are the date, time, temperature, and moon phase. It has a 32GB slot for ample storage. Pictures are automatically saved in JPEG format, and videos are in AVI. Can transmit images to a cellular phones and email address. Provides a smooth set-up and maintenance. Gives dark photos at night.